The Floe Edge is a magical place. 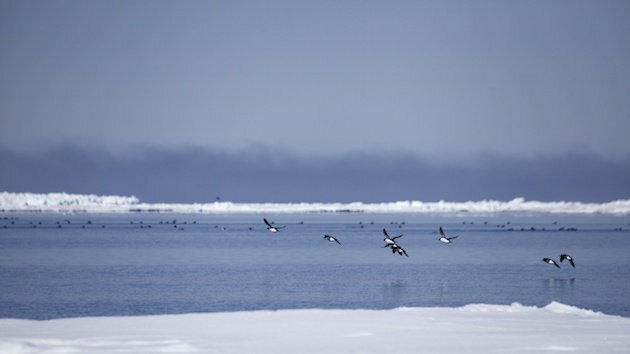 In simplest terms it is where the landfast ice meets the open ocean, and it is a magnet for wildlife, especially in the 24 hour light of the Arctic spring. I don’t get there every year, but I managed to spend one day there again this year. A scant 24 hours to take it in. This June my brother-in-law and I took off to Kangiq (Cape Crauford), the western edge of of the mouth of Admiralty Inlet to Lancaster Sound. The famed NorthWest Passage, where explorers such as Franklin tried to find a passage that Inuit first traveled some 5000 years before. Traveling was relatively easy this spring, the ice mostly smooth, and the cracks small and easy to cross. Only one gave us trouble, partially hidden in the unusually deep snow pack this year, making it difficult to figure out the best place to cross safely. It was the last we had to cross and slowed down by some fog we arrived at the Floe Edge about an hour later. The tracks of two young Polar Bear skirt a crack in the sea ice in Admiralty Inlet. They were likely recently driven away by their mother, after more than a year of being with her. 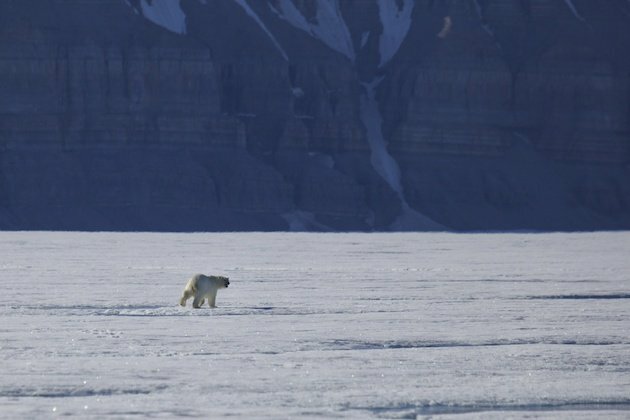 Wildlife concentrates at the Floe Edge, and although we just missed Narwhal as pack ice moved in just after we arrived, the place was littered with Polar Bear. 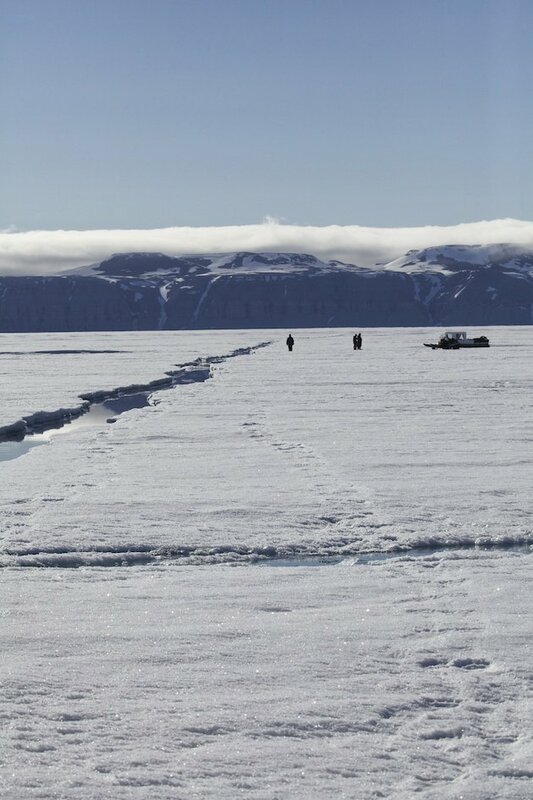 Tracks dotted the ice, and we saw several, although mostly they were at a distance. Still, with that many bear you have to stay vigilant. 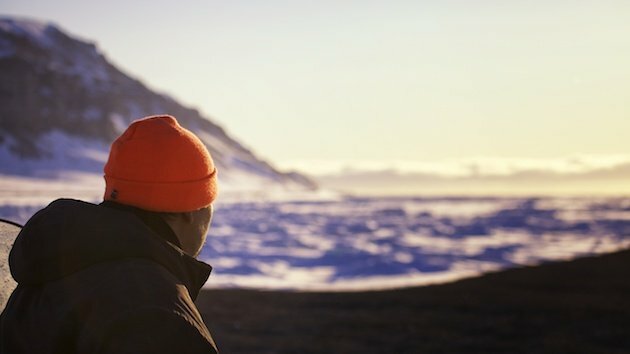 Indeed a scant two weeks earlier two young men from Arctic Bay were attacked as they slept in their tent, narrowly escaping with their lives. One described how he could see down the bears throat as its jaws closed round his head, the animal’s paw pushing him further into its maw. Luckily attacks are rare, but we made plans to stay in a refuge cabin at the point, and joined up with a group that had brought a dog, which acts as an early warning system. Further down Admiralty Inlet (on a later day) a young bear runs away from our noisy snowmobiles. 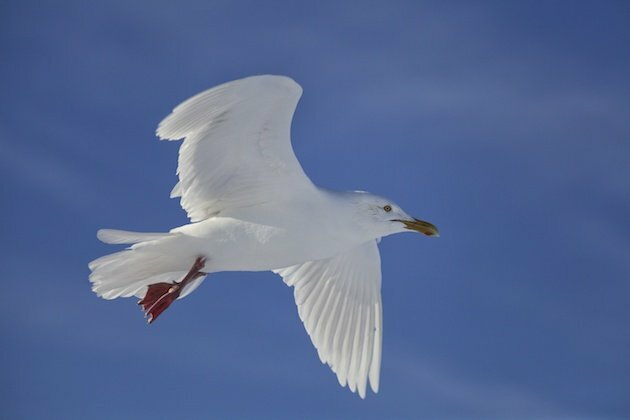 Birds, though, were there by the thousands. 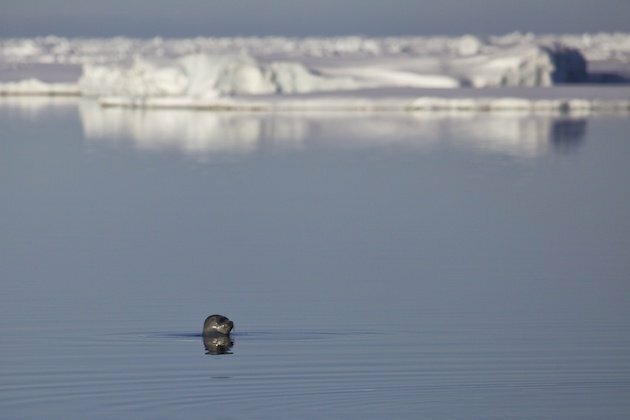 We found a spot where the pack ice hadn’t completely come in and stayed for hours, watching curious Ringed Seal watching us. The bird life is astounding, both in sheer number and in their nearness. Hopefully a few photographs can help convey the experience. Ringed Seal. 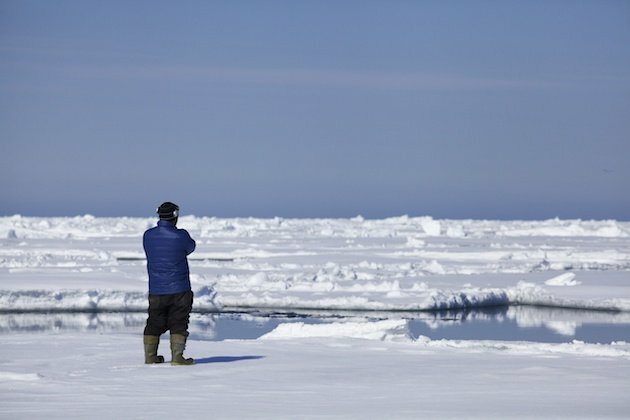 I’d taken along a hydrophone that allowed us to listen to the otherworldly sound of our other common seal, the Bearded Seal. 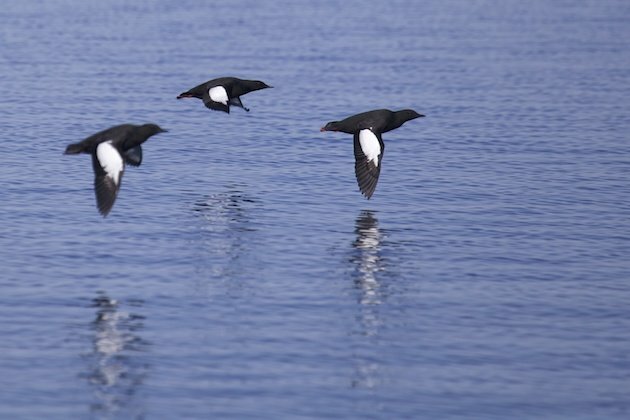 Thousands of Thick-billed Murre in open water. Ice in the foreground is landfast ice (the Floe Edge), the ice beyond is pack ice that has moved in. 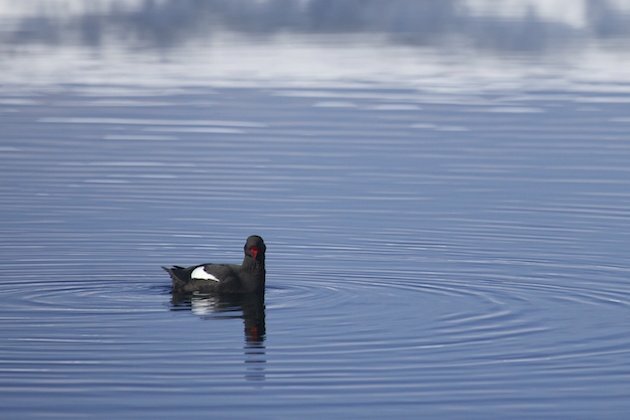 Not the best photo of a Black Guillemot, but it shows off the startlingly scarlet inside of their mouth. 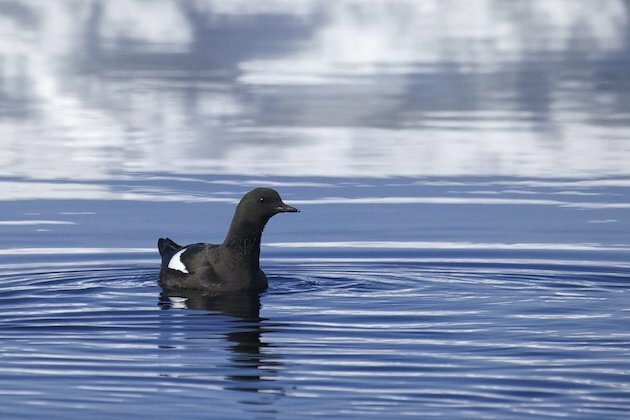 Ah, that’s a better photo of a guillemot. Their soothing, gentle whistle always surprises me for some reason, it is not the sound I expect to hear from them. This is big country, Kangiq is just off the right of the photo, jutting out into Lancaster Sound. 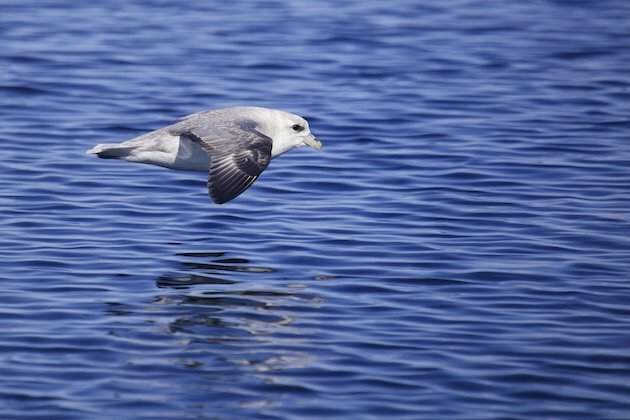 Birds, such as this Northern Fulmar pass by metres away. 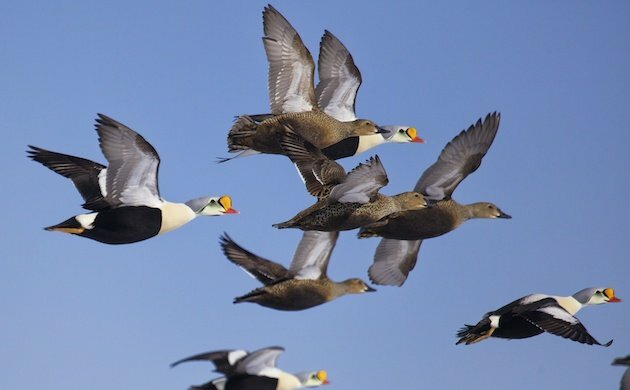 A colony of 35,000 to 50,000 PAIRS of these nest back the way we came, about 50 kilometres away. Standing on the ocean. This is the middle of Admiralty Inlet, hundreds of fathoms deep. As the pack ice moved in, we moved off towards the cape. This flock of King Eider numbered over 300 but I couldn’t get them all in with a long lens on. Strangely I didn’t notice the nearly full Moon (top right) in the photo until I was prepping this post. Perhaps my favourite photo from the trip, King Eider. 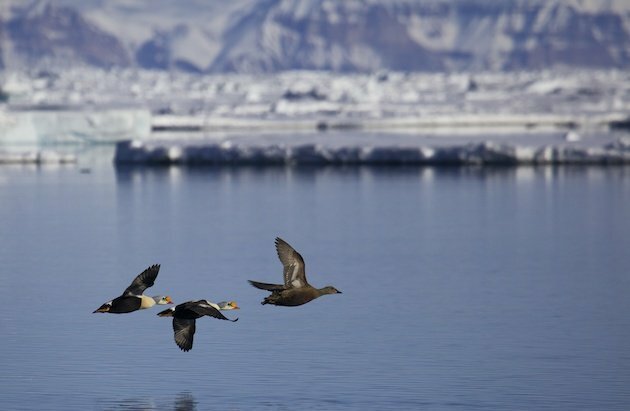 There are Common Eider here as well, but they aren’t as (ahem) common. 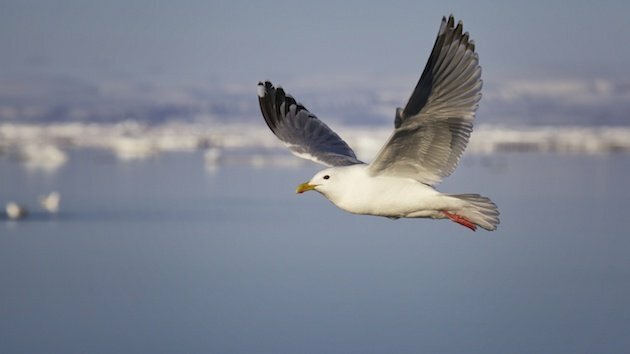 We had a lot of great looks at four of our gulls, although the Ivory Gulls were just fly overs and didn’t allow any decent photos. Which is somewhat unusual as they are quite a curious bird in general. This Glaucous Gull wanted past me, but seemed to want by on foot. 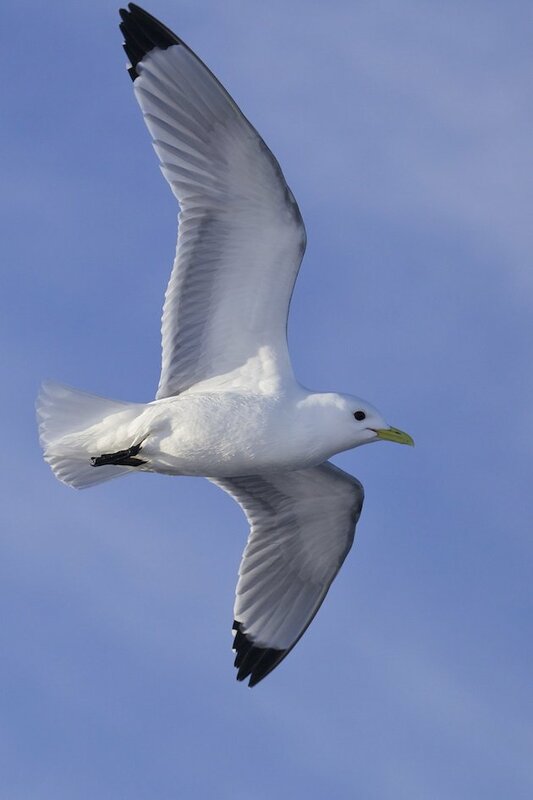 A highlight for me was close encounters with this delicate gull, the Black-legged Kittiwake. 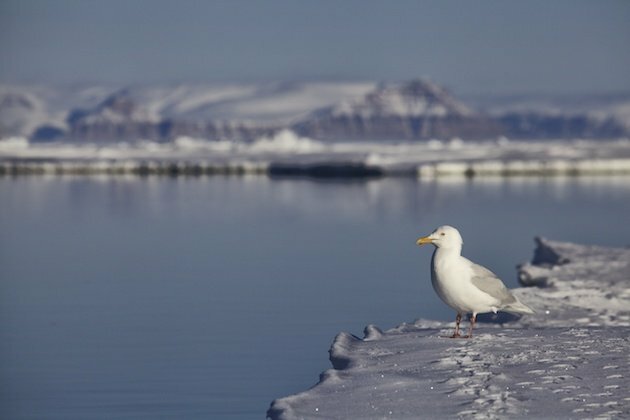 I love both their English and Inuktitut names, kittiwake and Tiratira. Midnight, almost time to grab four or five hours sleep. 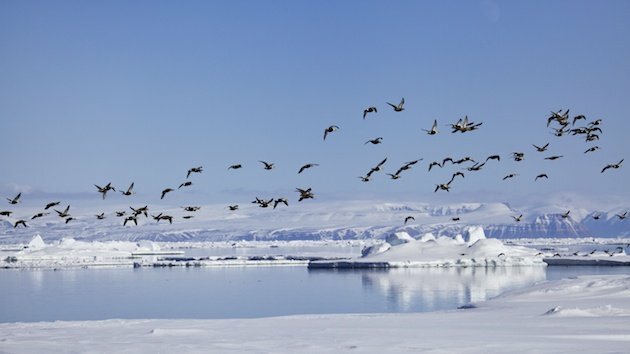 Inuit have lived at this point going back at least 4,500 years. Franklin and others sailed by here, Franklin spent his first winter about 200 kms in the direction my brother-in-law is looking. 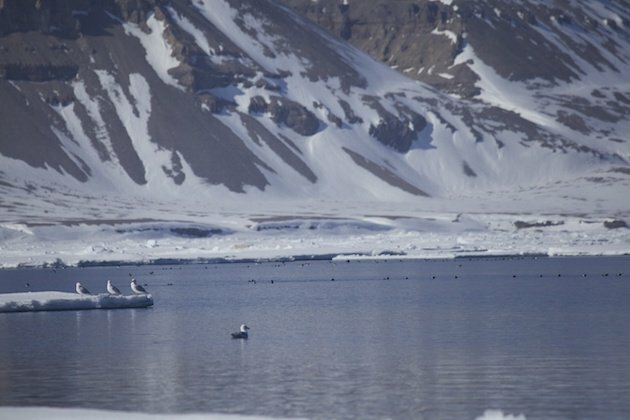 We’re listening to Narwhal breathing just out of sight in amongst the pack in Lancaster Sound. Oh my god, Clare! The photos alone are so breathtaking, I could scarcely take my eyes off of them to read your elegant story. Thank you so much for writing this for us. My goodness Clare, thankfully I didn’t have time for my second cup of coffee this morning or my heart would surely have failed me looking at your images!! A heart-felt “welcome back”, but please give us some fair warning, okay!? Thanks Donna, it is a breathtaking place, makes it easy to photograph. I’ll try and give you a heads up next time Jochen. Thanks for the kind words. Welcome back and what beautiful photos and you are truly privileged to be able to visit such an amazing area. You are living in a nature documentary! Looking forward to hearing from you a lot more and seeing a whole load more snowy photos! Just back from time to time, no regular beat. When I left I said I’d send in the odd post if I had one and if Corey and Mike wanted it. The Floe Edge is always magical. “… if Corey and Mike wanted it”. Yeah. As if there’s ever been a post from you they didn’t want. There’s always a first time Jochen.